Weep for print, read the ebook ... Amazon's KindleTechno-sceptics have been quick to dismiss the Kindle, Amazon's electronic books reader, as ludicrously overhyped and overpriced. They have a point. But the inadequacies of the Kindle should not lull us into thinking that e-readers will never offer a viable alternative to printed books. How the technology is likely - and quite soon - to meet a demand became clear just a few days before the Kindle launch, when Hachette announced that it was to move to supplying its backlist titles on a firm sale basis. Why are these events related? Because digital supply is becoming the most economical and environmentally friendly way of distributing the majority of published books. The returns system is one of the most distressingly wasteful by-products of the operations of the book industry. Books are shipped from distributors to thousands of bookshops; the copies that do not sell are shipped back from those thousands of bookshops to the distributors. By this time, most of these copies are unsaleable, and are moved on again to be pulped. A few years ago, a book industry body recommended that the process be centralised, with the unwanted books being sent to HM Prison Altcourse in Liverpool. There, the prisoners would drill holes in them. The work would provide an "ethical and focused employment pattern". The scheme attracted some ridicule, and was not heard of again. Returns affect commercial successes as well as failures - Bloomsbury courted unpopularity this year by setting a 10% returns cap on Harry Potter and the Deathly Hallows. And they affect books for which there has been a steady demand for years. According to The Bookseller, Faber last year got back 3,449 copies of Kazuo Ishiguro's The Remains of the Day, and 1,116 copies of William Golding's Lord of the Flies. Books such as these get returned only to be reordered a short while later. Publishers suspect that they are helping to manage booksellers' cash flows. The calls to stop this practice have been getting louder. Hachette is the first big publisher to respond, announcing that from the end of 2008 it will sell titles that are more than a year old "firm", with no returns allowed. Others will follow suit. However, booksellers are not all on side. Waterstone's would comment only guardedly, while an independent, Sheila O'Reilly of Dulwich Books, pointed out that her current terms with wholesalers allowed her an error rate of just 5%. For a shop with many thousands of titles in stock, that is a low figure. A firm sale policy would force her to become more cautious in her buying of backlist titles, she said. If publishers, and the environment, cannot afford returns, and booksellers cannot afford to stock titles without the security of being able to send some back, what will happen? The primary method of holding backlist stock will be digital. 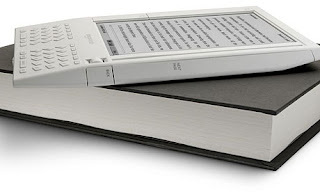 Books will be printed on demand, and they will be read on electronic readers - even if not on the mark one version of the Kindle. f the bookseller doesn't have the security of sending back books they can't sell they will begin to make considered and informed decisions on what they purchase.They will train their staff in the art of hand-selling, and will look to employ people who are readers and who have a passion for books. How is that bad for bookselling? The most regular users of sale or return terms are the chain stores who adopt a "stack 'em high and hope they'll fly" strategy to marketing.It allows them to wildly speculate on titles without any need for bad decisions or staff indifference to the title to impact on their bottom line, if they don't sell. They often take so much stock that it is difficult for smaller, more focussed, booksellers to obtain timely supply at the peak selling time. The to-ing and fro-ing of books being shipped to booksellers and then back again pays off only if you are a courier company or their fuel supplier, and the impact of that on the environment must also be a major concern. Currently in the UK there is a working party from across the industry looking at just this issue. As an independent bookseller I am often told by publishers that my returns percentage is too low at around 1% and there is a general acceptance that anything around 15-20% is the norm. I would much rather buy on firm sale and take an increased margin for my risk. I can't think of any other industry where suppliers lend their customers stock for up to a year and guarantee a full refund on what they didn't or couldn't sell. For bigger customers they even offer larger discounts for that privilege. This is head and heart stuff. In our heart, we like to think we know our customers and are confident we can offer the books they want to read that is our job. It is naive of John to suggest publishers lend us their books. We pay for the privilege while they have our funds they can reinvest and turn the cash over a number of times before and if returns are due and they save on warehousing costs into the bargain. Our head tells us, by carrying bulk stock we can make a statement, attracting the customers attention and saying-we have confidence in this book and thereby increase sales but we can also offer you many alternatives. By carrying bulk stock we also protect ourselves from out of stocks and long delivery periods. Is he practicing serious ”just in time” stockholding with all that entails with replacement stock not being held in New Zealand for a whole range of publishers or is he calling in favours and car stock? Book customers are also more demanding they want the latest books immediately and expect a huge backlist as well and as we all know walls and shelves are not elastic, there comes a time when we must mark down or return aged stock. Yes we would be willing to negotiate retrospective discounts for firm sale instead of returns, lets talk, but in the meantime publishers and booksellers will work together to get the books out there while there are still a few book buyers on the street. Imagine if the readers download from the website to PC or readers, not only will there be no returns but there will be less need for warehouses, lower production costs, instant royalty payments in fact changes all round . I think that Kindle is one great device. I can take it everywhere I want and read all the books and magazines on the go.